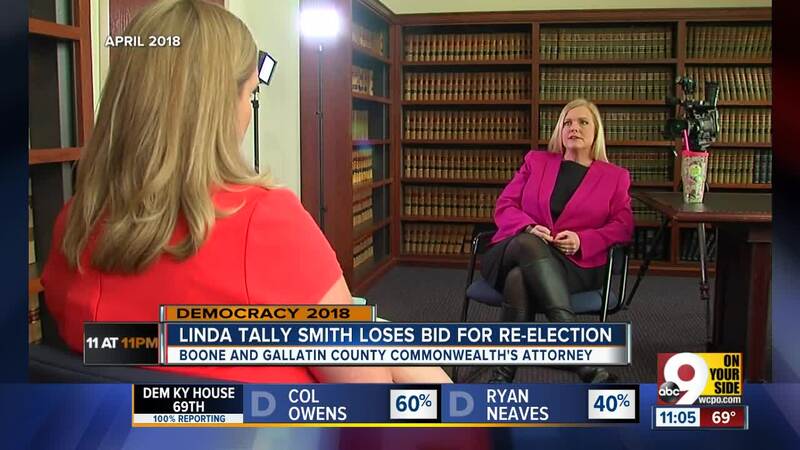 BURLINGTON, Ky. – Linda Tally Smith lost her bid for re-election Tuesday as the commonwealth's attorney for the 54th Judicial District, a position that serves both Boone and Gallatin counties. Smith faced accusations that she withheld evidence in a high-profile murder trial, a special prosecutor's probe into possible criminal charges against her and embarrassment over a sexual affair that became public knowledge. 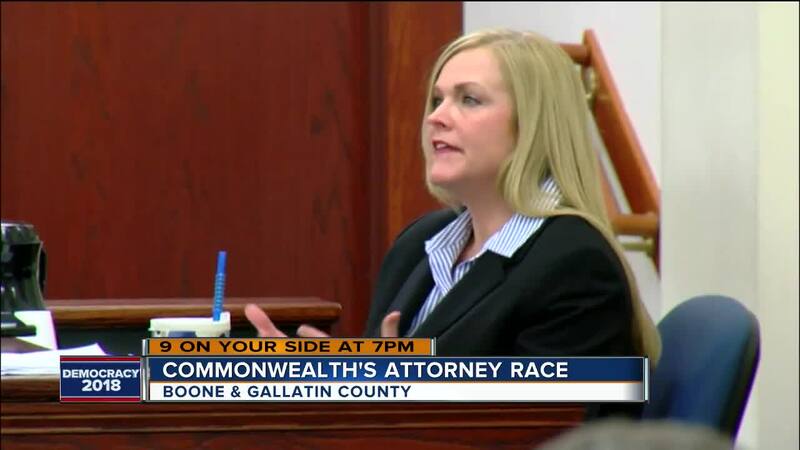 She was defeated Tuesday by Republican Louis Kelly, an attorney who has lived in Northern Kentucky since 2004 and currently lives with his wife and their two children in Union. He's a graduate of the University of Kentucky and the Northern Kentucky University College of Law. Kelly is a partner at the firm Adams, Stepner, Woltermann & Dusing. With all precincts reporting , Kelly defeated Tally Smith 7,092 to 3,393 votes. Kelly told WCPO last month he believes Tally Smith "violated the public trust" while serving as commonwealth's attorney. "This wasn't a mission of 'I have to be the commonwealth attorney,' but I felt very strongly that somebody else needed to be," Kelly said. "I feel like these offices are privileges, and if you engage in certain behaviors, you forfeit those privileges." Kelly said Tuesday night that he was "humbled" by his win. “I don’t think this was necessarily about me," he said. "I think what I take from this is that the voters of Boone and Gallatin County care about public trust and they care about integrity." Both campaigns set up fairly standard campaign websites. Kelly's office also launched lindatallysmithfacts.com, which highlighted unflattering news stories about Tally Smith. Despite controversy and opposition from some in her own party, Tally Smith said she had no regrets running for re-election. She told WCPO in an exclusive interview last month that she “hasn’t done anything wrong." “I have never given in to bullies. Never,” she said. “That last thing that I will let my children get from this whole experience is that you back down and give in to bullies." Tally Smith is a lifelong Northern Kentucky resident. She lives in Union with her husband, District Court Judge Jeff Smith, and their three children. She's a graduate of St. Henry District High School, Northern Kentucky University and the University of Kentucky College of Law. Tally Smith said it was her dream to prosecute felony cases. After working under another commonwealth's attorney for a few years in the late '90s, she won the race for 54th Judicial District commonwealth's attorney in 2000. Facing no opponents, she was re-elected in 2006 and 2012. But events last year cast a cloud over Tally Smith's career. David Dooley, who had been convicted in 2014 of bludgeoning his coworker Michelle Mockbee to death at Thermo Fischer Scientific in Florence two years earlier, got new lawyers who said new video evidence in the case raised questions about his guilt. Tally Smith had prosecuted that case. That evidence was a surveillance video showing a man approach a door behind the building the night before Mockbee was killed. Dooley's defense lawyers said prosecutors had failed to share the video with them during the trial, and they had never seen it. A judge agreed to hear the defense lawyers' case. That was when Detective Bruce McVay admitted in court that he and Tally Smith had an affair beginning after the original trial, with him using the fake name "Carver Davidson" and her using "Chiquita Queen." But McVay and Tally Smith disputed what happened with that video. McVay said he told her about the man and the video before the trial. Tally Smith had said he didn't tell her about man on the video until after the trial. Also, she said her office gave the video to the defense team three times, but they never went through it. "The most important thing is the (building's) security was never breached," Tally Smith said. "So this random guy walking through the parking lot would not have been a big deal even if they let me know about it." Dooley's lawyers had also obtained emails and texts between Tally Smith and McVay and an 18-page letter Tally Smith wrote to McVay but never sent. "I get to live with the worry that someone on the defense side will find it at some point and that we'll all wind up in trouble over it and the entire case will be tainted over it," Tally Smith wrote. Tally Smith said that letter was about a different case, in which a misunderstanding made her suspect McVay may have written something untrue. "I was so upset with him at the moment that I wrote that letter, that I just assumed that everything bad that I had heard about him must have been true," Tally Smith said. McVay has since retired. His attorney, Benjamin Dusing, told the I-Team last year that McVay also regretted the affair, but that he stands by the work he did. "I feel horrible about this situation and how it's affected him and how it's affected his family, because it's not fair that people think this stuff about him, either," Tally Smith said. "But it's so bothersome that people continue to just throw out there that I 'withheld evidence,' which never happened, and that I've 'covered up misconduct,' which never happened." Tally Smith said no other cases were affected. "I'm still trying cases and winning," she said. "I'm still working cases and winning. We're still investigating cases and charging them. We have not had a glitch in the functioning of our office despite everyone’s predictions to the opposite." Last May, a judge vacated Dooley's conviction, saying he's entitled to know about the person seen walking in the video. The judge also found the commonwealth's attorney's office did not intentionally withhold evidence. "The judge's finding also includes a finding of ineffective assistance of counsel by his defense, because they did not take advantage of the opportunities to get help to view the video," Tally Smith said. A retrial is still pending.